While AICR recommends limiting red meat to 18 ounces per week, it recommends avoiding processed meat like bacon, sausage and deli meats for cancer prevention. 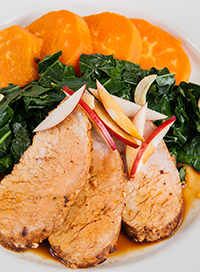 Pork tenderloin marinated with lime juice is a lighter way to enjoy pork. Limes have limonoids, which researchers are finding may have promising anti-cancer potential. As a red meat, AICR recommends limiting to 18 ounces per week for cancer prevention, but that doesn’t mean you can’t enjoy small portions occasionally. Steam some fresh veggies and pair with quinoa or brown rice to have a meal that mirrors AICR's New American Plate. 2 g carbohydrate, 24 g protein, 0 g dietary fiber, 90 mg sodium. In large mixing bowl combine garlic, lime juice, 1 tablespoon oil, molasses, soy sauce, chili powder, salt and pepper. Place tenderloin in bowl, turning to completely coat with marinade. Heat large ovenproof pan or cast iron skillet over high heat. Add remaining oil. When oil is hot, use tongs to place meat in skillet, being careful to avoid splatter. Turn tenderloin every 2-3 minutes for even searing to seal in juices. Remove pan from burner. Pour remaining marinade over meat and brush to coat well. Add 3 tablespoons water to bottom of skillet, not on tenderloin. Place pan in oven. Cook approximately 30 minutes or until a meat thermometer inserted into center reads 145 degrees. Remove skillet from oven and allow tenderloin to rest for 5 minutes before slicing. For garnish, if using, cut apple in thin slices. Cut tenderloin diagonally in 1/4-1/2 inch slices. Arrange slices on plate, garnish with apple slices, and drizzle with remaining juice from pan.